From stolen merchandise to podiatry franchise, Tyson takes on a ride that is as informative as it is compelling. In this episode you get to listen to a true business genius, who can turn anything into profitable enterprise. 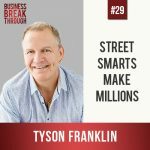 We hear about Tyson’s incredible business journey starting when he was just 12 and working as a “fence” in Elementary School to building his own Podiatry empire across Australia, and then cutting it down to one location to be even more profitable. The wisdom in this episode will give you immediate tangible business growth, as well as make you laugh. 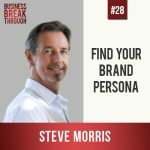 Today we speak with Steve Morris about real design in branding. There are many graphic designers and marketing companies out there, but Steve has a Masters Degree in Graphic Design. We contrast this expertise with what you average designer learns today, and delve deep into high level branding and graphic design strategies. We also discuss the struggle of being an expert who can only earn money one-to-one training people, and how to expand that to create “more of you” in a really novel, win-win-win manner.